Gene och Shannon Tweed kommer att gästa TV programmet Doctors den 17 mars. De ska bl.a prata om Shannons rädsla för bröstcancer. 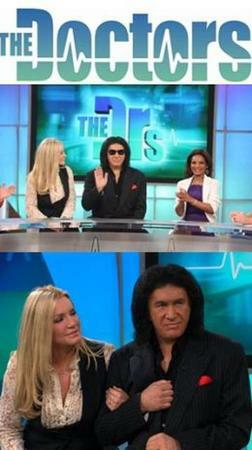 On Wednesday, March 17, Rock star Gene Simmons and his girlfriend Shannon Tweed, stars of A & E’s Family Jewels, appear on the Emmy-nominated daytime talk show THE DOCTORS, from Stage 29 Productions and CBS Television Distribution. The couple opens up about Shannon’s recent breast cancer scare that began with one seemingly trivial symptom. Revealing shocking statistics about the disease, Simmons states that one out of eight women will get breast cancer, and makes an emotional plea urging men everywhere to make sure their loved ones get tested immediately upon showing any symptoms.